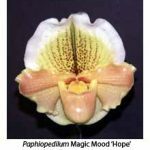 Within the popular Slipper Orchids, the modern or complex style paphiopedilums seem to have declined in popularity over the last few years. 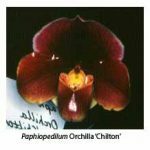 This is partly due to a revolving trend amongst orchid growers that sees the cultivation of various types of orchids move in and out of favour. 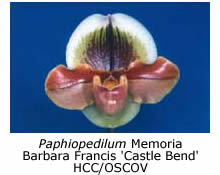 It certainly goes in cycles, and in my fifty-odd years of growing orchids I’ve seen a few. 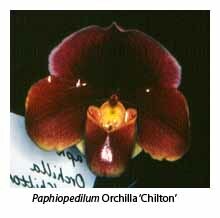 At present, interest in Paphiopedilum species seems to be at an all-time high. seedlings are now available of previously rare and expensive species, such as the majestic P. rothschildianum, endemic to Mount Kinabalu, Sabah. rediscovery of ‘lost’ species, such as P. sanderianum. 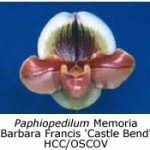 world-wide interest in the ‘new’ Chinese slipper orchids, such as P. micranthum, P. armeniacum, P. malipoense, P. hangianum etc. albinistic forms of species becoming more readily available, for example, P. sukhakulii, P. fairrieanum, P. philippinense and P. charlesworthii. We have also witnessed the development of Vinicolour paphiopedilums in the Maudiae style, with flowers a deep, glossy burgundy colour to almost black. Also popular are the strap-leaf multifloral hybrids, particularly those with P. rothschildianum, P. sanderianum, P. lowii or P. philippinense in their backgrounds. 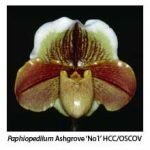 Whilst we grow and admire the above variants, this paper will deal with the cultivation of modern complex Paphiopedilum hybrids. HISTORY. 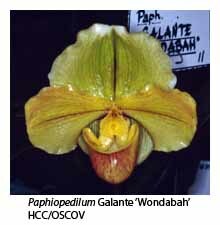 The first Paphiopedilum hybrid was registered back in 1869. It was P. Harrisianum – a crossing of P. barbatum and P. villosum. This primary hybrid is still seen in many collections. Since then there have been countless thousands of hybrids made, resulting in the many cultivars that we have today. 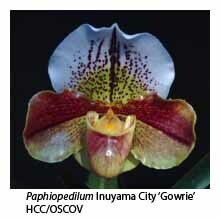 Over 90% of these numerous hybrids have only a handful of species in their pedigree. The major species behind these hybrids are, in order of importance: Paphiopedilum insigne and its albanistic forms, Paphiopedilum villosum and the closely related Paphiopedilum boxallii, Paphiopedilum spicerianum, Paphiopedilum charlesworthii, Paphiopedilum bellatulum, Paphiopedilum druryi, Paphiopedilum exul and Paphiopedilum niveum. These species are generally easy to cultivate in favourable conditions and, most importantly, their hybrids exhibit hybrid vigour and are strong growers. POTTING MIXTURE. Paphiopedilums are generally semi-terrestrial growers, often with their hairy roots amongst thick layers of decaying leaf litter on the rainforest floor. They demand a potting mixture that must retain moisture, drain freely, be slightly alkaline to neutral in pH, and be ‘open’ to allow air to the roots. We currently use pine bark as the sole ingredient of our potting mix. Fine grade bark is used for seedlings, and medium grade bark for larger seedlings and adult plants. Deep black pots with generous drainage holes are used; we never use terracotta pots. I dust the surface of the mix with hydrated lime twice each year, as this helps to keep the mix slightly alkaline. Moss growing on the top of the pot may indicate that the mix has become acidic, and is turning ‘sour’. It is best to re-pot in fresh mix when this happens. HOUSING and SHADING. Whilst you will get satisfactory growth in a bush-house with a Sarlon shade-cloth roof, paphiopedilums will grow better and be less susceptible to fungal and bacterial diseases if the house has a solid roof. Basically, ours is a shade-house with fibreglass on the roof and on the southern and western walls. Many growers use traditional glasshouses with good results. Shade-cloth (shade factor, 70%) is fine for most of the year, although during the warmer months it is advisable to throw another layer of shade-cloth over the top. 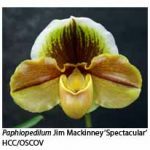 A good test for the correct level of light for paphiopedilums is to place your hand an arm’s length above the plants – a shadow should just be detectable when the sun is shining. AIR MOVEMENT and HUMIDITY. 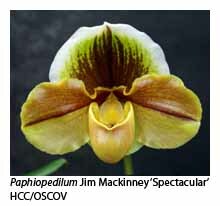 Paphiopedilums, like almost all orchids, enjoy a constant supply of fresh, moving air. If the location of your orchid house does not allow for this, the strategic placement of oscillating fans will pay dividends. Keep the floor damp, as these plants appreciate high humidity levels. Most of our mesh benches are only 50 cm high. TEMPERATURE. 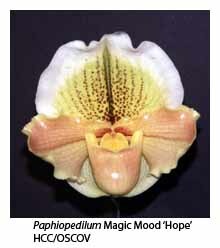 Paphiopedilums can cope with a high fluctuation in temperature. They prefer a minimum temperature of 6°C, but will tolerate a lower temperature for short periods (provided that the temperature rises significantly by late morning); the temperature occasionally falls as low as 2°C in our shade-house. White-flowered hybrids prefer a minimum temperature of 12°C. In summer our plants have experienced temperatures as high as 47°C for several hours, surprisingly without ill effect, as they prefer a maximum of 30°C. WATERING and FERTILISING. Slipper orchids prefer to be kept just moist and never like to become completely dry. Obviously, prevailing weather conditions will affect the frequency of watering. It’s best to give them a thorough watering as opposed to just a splash. We usually water weekly in winter and every second day in summer. We water the whole plant, even those in bud. Often bud rot is the result of a poor root system, not because of water in the leaf axil. Paphiopedilums are not gross feeders. We fertilise at quarter strength every second watering throughout the year, using a variety of organic and inorganic fertilisers. PESTS and DISEASES. Much has been written on this topic. Basically, if your growing conditions are sound, you should not experience major problems with fungal spots on leaves or bacterial attack. Caterpillars can make short work of a developing bud, and mealy bug and scale are perennial problems. Appropriate insecticidal dusts or sprays should be used to control these pests. Always follow the safety instructions provided. RE-POTTING and DIVIDING PLANTS. Plants should be re-potted in fresh mix every second year, growths (and a good root system). Seedlings can be potted at all times, except for the middle of summer or winter. Sick plants should be inspected and re-potted if necessary at any time. HOW CAN I GET A GOOD ONE? Because paphiopedilums cannot be commercially mericloned, divisions must be made from the original plant to perpetuate the desired cultivar. Their prices are determined purely by the supply/demand ratio. It’s worth noting that three of the most successful show-bench plants, P. Orchilla ‘Chilton’, P. Gaymaid ‘The Princess’ and P. Danella Chilton’, have been around for over 40 years, and have stood the ‘test of time’. Seedlings are the cheapest option. However, you need to flower a lot to increase your chances of getting a good one. It’s better to buy a quantity of one cross, rather than one of a number of crosses. Remember, all the champion cultivars were once seedlings! And when you flower that special plant, you will see that the effort was worth it.